A quick Google search for shipping cars overseas will yield pages and pages of people and companies ready and eager to take your money. But long before you choose someone to do this difficult and expensive work on your half, it’s important to educate yourself on the costs involved with shipping a car overseas and whether or not it will really be worth it for you. If you’re sending a vehicle to or from the United States, unless your car is coming from or to Alaska, Hawaii, Puerto Rico, Guam, the U.S. Virgin Islands or another overseas territory, the bulk of your overseas shipping will be international shipping. But unless you live in a major port city (here’s looking at you, coastal dwellers), you’ll also need to take into account how much money it will cost to ship your vehicle domestically to an international shipping port. If you drive a very energy-efficient vehicle, it might be worth taking a vacation and driving the car to the port city yourself, especially when gas prices are very low. But if you’re shipping a truck, SUV, or another gas guzzler (or can’t take time off of work), it might be worth it to ship your vehicle. According to A-1 Auto Transport, the average cost of shipping a vehicle domestically in the United States is roughly $0.50 per mile for a normal-sized vehicle (that’s before you take into account all of the other associated costs, like insurance). By this measure, shipping a sedan from Chicago, IL to New York, New York would cost you about $400. Shipping rates can skyrocket quickly for larger vehicles, even “normal” family vehicles like SUVs. If the company shipping your vehicle domestically also ships internationally, you may get a discount if you use the same transporter for both the domestic and international legs of your vehicle’s journey. If you’re moving to another country and will be able to both drop off your vehicle and pick it up, this part is a bit easier: the buddy can be yourself! But if you’re importing a car from overseas, especially from a country where English is not commonly spoken, it’s a good idea to have someone you trust (and that speaks the language) to make sure your car makes it onto the ship and through the bureaucratic hoops that it will need to proverbially jump through to make it out of the origin country. Make sure you trust the individual or organization responsible for getting your car to the port and onto the ship. Once your vehicle arrives at the port, you will also need to have someone who has access to the port itself—you can’t just waltz up to a ship and drive your car away! If you’ve organized transport through a company and you’re picking your vehicle up in the U.S., they should be able to take care of this step for you. But if you planned on picking it up yourself, you will need a Transportation Workers Identification Credential (TWIC) in order to access the dock—in most cases this expensive card that requires a several week waiting period is not worth the hassle and paperwork. There are two main commonly used methods of getting your car cheaply and safely across the ocean—and no, unless you’re a high-roller with lots of extra money to spend, your car will not be flying over the ocean in an airplane. It will be loaded onto a ship and carried across the ocean on a freight ship, and it will be several weeks until you see it again. Unlike most types of heavy freight, cars are designed to move without the huffing and puffing of horses or humans making it move or the grind of an even bigger machine picking it up. Because of this convenient fact, the cheapest method of shipping a car across the ocean is letting it do the heavy-lifting for you, so to speak. The not-so-technical term for this method is exactly what it sounds like: roll on, roll off, or RORO for short. The vehicle is driven onto the boat just like you would drive it into a parking spot and then secured to the cargo hold or deck of the boat. It’s essential that you clean, service and inspect your vehicle before shipping—if extra items are left in your vehicle, you could be held up at customs (and charged for an inspection in many countries) or your vehicle could be damaged. If your vehicle is not properly serviced you could end up having to have it towed if it doesn’t run, at an extra cost and hassle to you. RORO might be the easiest method of getting a car onto a ship, but most freight isn’t shipped around the world open and exposed to the elements. If the image of your vehicle taking a brutal beating from high winds and rain is unappealing, you’re in luck—the most common method of shipping a vehicle (or anything, for that matter) overseas is in a shipping container. It will cost a bit more money, but in many cases is a lot easier and safer for your vehicle. The cheapest often will often be a shared storage container shared with a few other vehicles. In many cases, you can also get your own storage container fill the unit with other items, which can come in handy if you’re moving more than just a car overseas. For most people, shipping a vehicle by air wouldn’t be even close to worth it—the costs of shipping a car via airplane can quickly exceed the worth of the vehicle itself! That being said, if you have a rare, exotic, or classic car, shipping by air freight might be worth it. It is the safest method of shipping because there is very little handling of your vehicle other than getting it on and off of the airplane, and it won’t be sitting around waiting to be unloaded or reorganized to make room for other cargo until it reaches its destination. The speed it will get to you also can’t be beaten: while shipping container and RORO shipping may take several weeks to a month to reach your destination, if you fly your car via air freight, you’ll likely see it again in a couple of days. Shipping a vehicle overseas requires an incredible amount of paperwork. Many experts recommend hiring a customs broker, whose services will generally cost a few hundred dollars because the paperwork is very complicated and the process often requires going to the customs office multiple times before you can even think about getting your vehicle onto a ship. If you are shipping a vehicle to or from a country where you don’t speak the language, this becomes even more essential. Once the boat arrives carrying your car, there’s even more paperwork. Before you can ship, in addition to filling out all of the aforementioned paperwork, you’ll also need clear originals of your Passport and the title and bill of sale for your vehicle, which will likely need to be notarized. You will also likely need to fill out an Export form and a Declaration of Dangerous Goods form. If you have a loan on your vehicle, you’ll also need a notarized statement from them stating that it’s okay to ship the vehicle overseas. You should also make a copy of your keys because you’ll need to give one set to the shipping company. Taxes: Make sure you look up import taxes and take this cost into consideration. This could easily be more than the cost of transport in some countries. Insurance: Of course, it’s essential to speak with your insurance agent to find out exactly when, where, and how your vehicle will be covered. In the vast majority of cases, your vehicle will not be covered in the ocean itself, and you’ll need to pay 1.5-3.0 percent of the vehicle’s worth for shipping insurance (in this example, $450 to $900 for a $30,000 vehicle). Vehicle Safety Standards: Make sure that the vehicle meets the safety and emission standards of the destination country, otherwise it will not be allowed into the country. 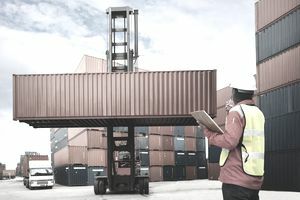 A good shipping company can help eliminate the need to set up a buddy system for getting your car to and from the ports at both ends as well as help with paperwork, insurance (both marine and auto), and other parts of the overseas shipping process. Make sure you look for a reputable organization and ask them as many questions about the process as possible.